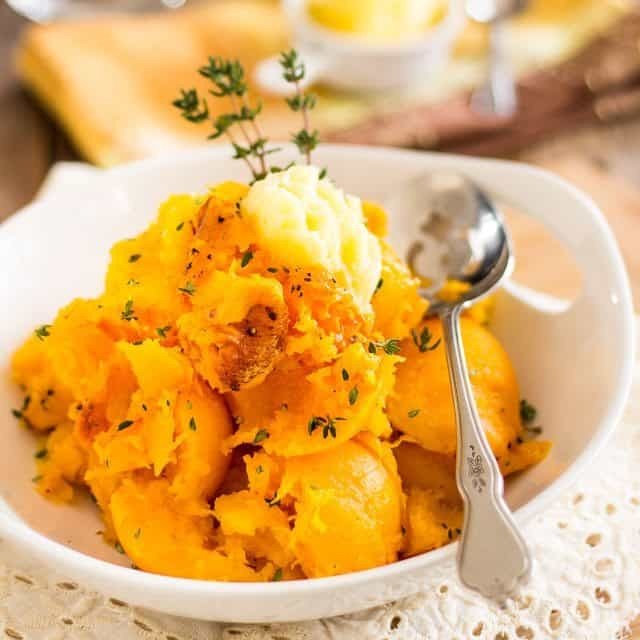 I recently came to realize [once again] that I don’t often enough share my super easy, every day life recipes, like this Oven Roasted Butternut Squash, which I pretty much eat on a weekly basis whenever squash is in season. I guess it’s because I find they are way too simple to deserve the exclusivity of an entire post. Plus, my mind is always like: “Duh, people already KNOW how to make this basic stuff, they certainly don’t need me to show them again. But sometimes, even when we know how to make something we tend to forget about them and it’s nice to be reminded of their existence. Plus, it’s often interesting to check out someone else’s take on a familiar recipe. For me, butternut squash that gets slowly roasted in a hot oven until it caramelizes would be one of those things. Caramelization really is the key with this dish. You’d be surprised what it brings to the squash in terms of depth and flavor. Also, baking the squash as opposed to steaming or boiling it makes it so rich and thick and creamy… you don’t need to do or add anything to it after it’s done baking. Oh, and for the record, you mustn’t absolutely use butternut squash for this dish to work. You can use this exact same technique with basically any kind of winter squash: buttercup, acorn, carnival, kabosha or even spaghetti squash. The first thing you need to do is preheat your oven to 375°F. Small detail, but very important nonetheless. This makes all the difference in the world. Your oven needs to be nice and hot as soon as the squash enters it. 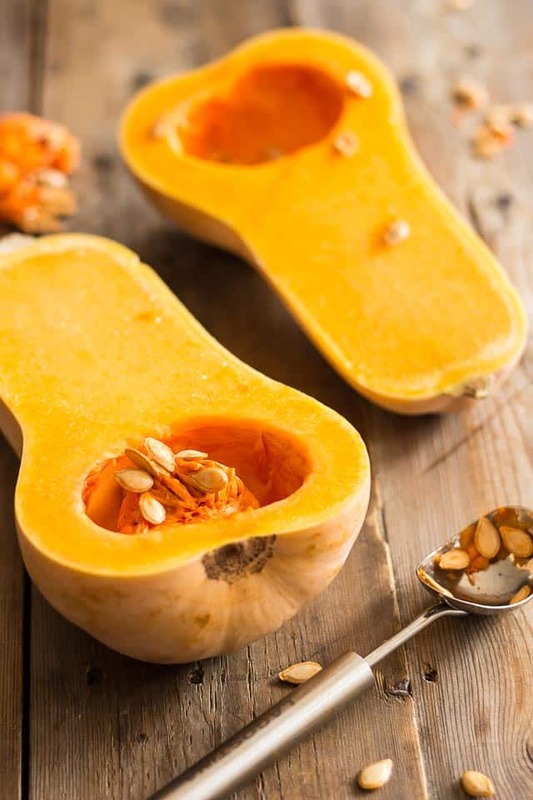 While that temperature is climbing, cut the butternut squash in half and scoop out the guts and seeds with a spoon. I like to use my trusty ice cream spoon for that. I find it has the perfect shape as well as the necessary sturdiness and the sharp edges make the task so much easier. 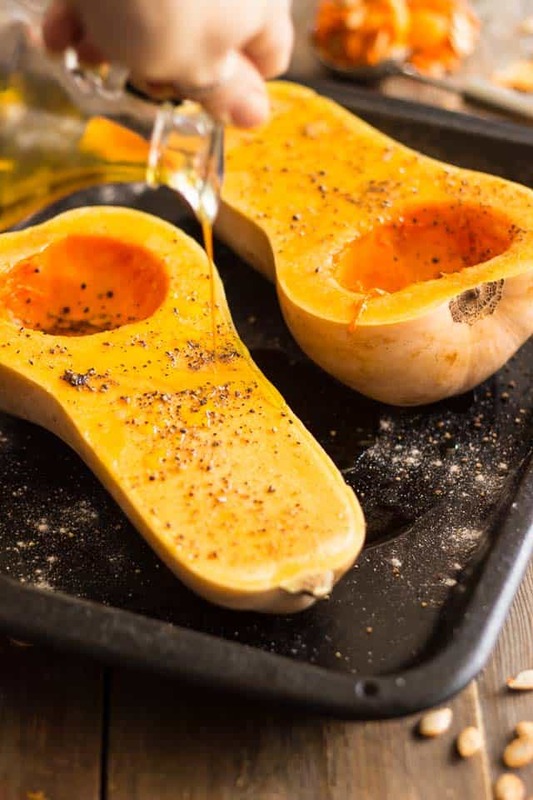 Place your squash halves in a broiler pan and drizzle them with a generous amount of extra-virgin olive oil, then sprinkle liberally with salt and pepper. Turn the squash flesh side down and pour about 1/4 cup of water at the bottom of the pan. Bake the squash the oven, uncovered, for about 40-45 minutes, until it becomes really soft and can easily be pierced with the tip of a sharp knife. 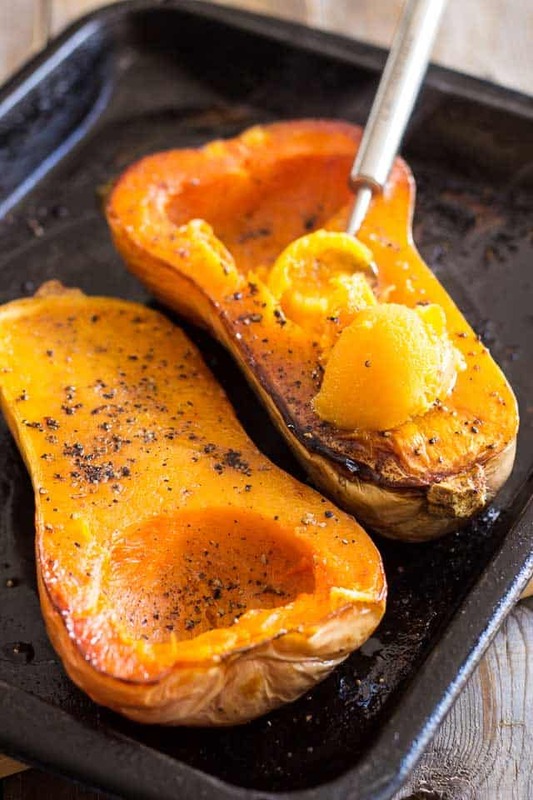 When the squash is fully cooked, remove it from the oven and allow it to cool for a few minutes, until you can safely handle it, then flip it over and scoop the flesh out with a spoon. Again, my weapon of choice for this would be my trusty ice cream spoon! 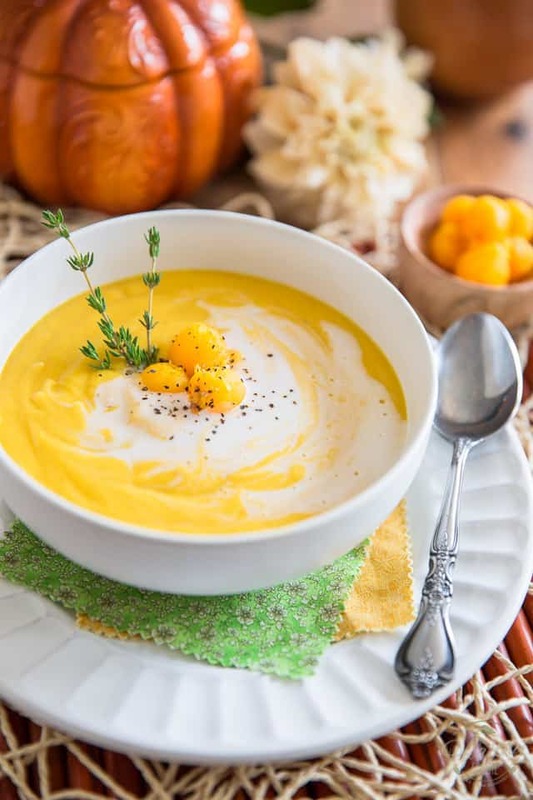 You can serve the squash as is or mash roughly with a fork or potato masher if you’re in the mood for something that’s more like a puree. And there you have it, so simple, yet so elegant. This tasty side dish goes well with just about anything and goes down very good any time of day. 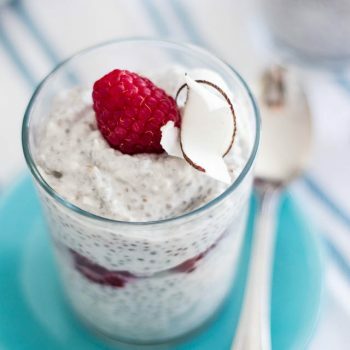 It’s perfect at breakfast, lunch or dinner and is especially fabulous post work-out! 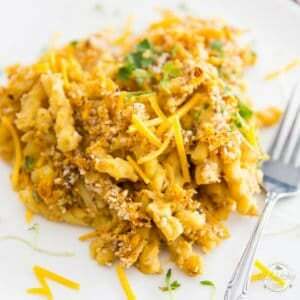 It can also very easily be made ahead of time and reheated in the microwave or in a skillet over medium heat. The beauty of the skillet technique is that you can add a generous amount of ghee and have that squash caramelize yet again. Oooh goodness! Can you feel the love? I think I am totally, shamelessly, helplessly infatuated! Cut the butternut squash in half and scoop out the guts and seeds with a spoon; discard. 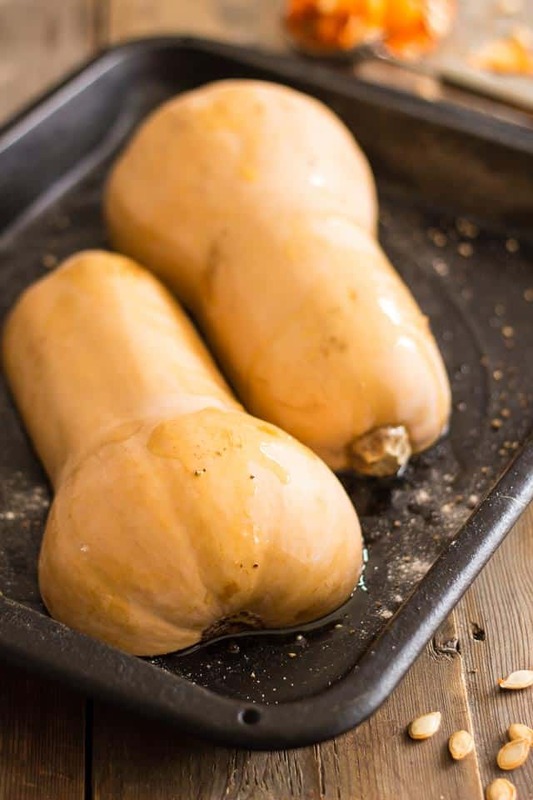 Place both squash halves in a broiler pan and drizzle them with a generous amount of extra-virgin olive oil, then sprinkle liberally with salt and pepper. Why not change things up a bit and turn this delicious oven roasted butternut squash you just made into a soup? Click here for the recipe, or on the above picture. 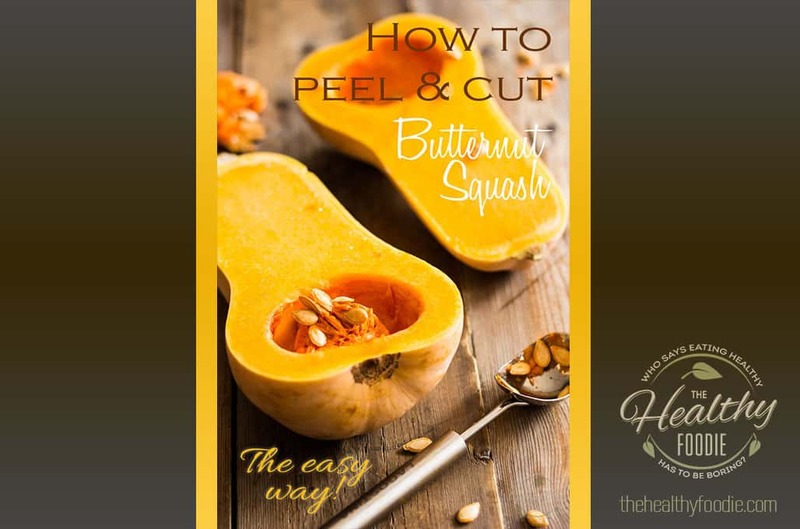 Looking for an easy way to cut and peel your butternut squash? Check out the above post to learn how! Yes, that mayo recipe makes me feel like a French chef! I also use the immersion blender trick for Caesar salad dressing and it works perfectly every time. YAY! So very happy to hear, Dana! Have you ever tried My Evil Twin’s Caesar Dressing? It’s to die for! Now we ALL want the Mayo Recipe!!???? This is great! I like the pictures. Hey Sonia, you are right, I’d like to see and post simple recipes myself more often. Readers might be amazed, but on weekdays us bloggers don’t exclusively eat 15 ingredient dishes. I wish! 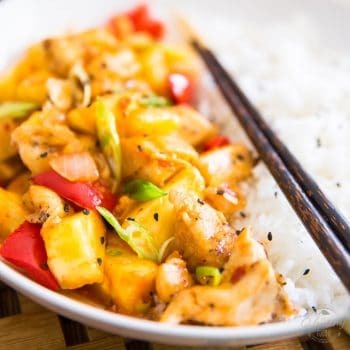 This recipe looks simple, yet tasty. Mom & dad are coming over tonight, they are healthy foodies as well. I’ll proposite this dish to them! So true, Angela. Sometimes, nothing beats simplicity… and sometimes, I get tired of making / eating elaborate dishes. Nothing like a side of steamed Brussels sprouts with a great big dollop of ghee and a sprinkle of salt and pepper. Which, by the way, would go indecently well with this oven baked butternut squash. Hope your folks enjoy the squash! I don’t know either! Is it butter or margarine? I made this, and when I scoop it out I put a little cinnamon, brown sugar and butter. This is so good, hope you like it! So this recipe was great, easy and delicious. But the ice cream scoop was brilliant! I felt like I was learning how to cut an avocado the right way all over again – a whole world opens up! Hi! I’m trying this recipe as I write–butternut squash in the oven–and wanted to confirm that we don’t turn it back up once we’ve turned it upside down, correct? Just wanted to make sure. Thanks! That is correct, Michelle. Bake the squash flesh side down the entire time. 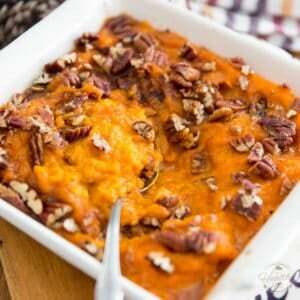 I’ve always baked butternut squash this way and love it as you do. However, after it is soft, I turn it over and put butter and salt and pepper in the indentation and then put it in the oven again so it can carmelize. I’ve never heard of ghee though. What is that? Ghee is butter that’s been clarified to remove all traces of milk solids from it, leaving nothing but the fat behind. Can you use just a regular baking sheet for this? Or does it have to be a broiler pan? A regular baking sheet would do the trick, just make sure that it’s rimmed! I made this the other night for my family and it was amazing! So simple & delish! I did use the broiler pan as mentioned here, but I’m wondering by a broiler pan & not say a half sheet cookie sheet?? Is there something specific about the broiler pan?? Big thanks! I find that the broiler pan does a better job at caramelizing the squash, and its size is just perfect for the task, too. Plus, I like to keep my cookie sheets “clean” so I tend to use them only when baking cookies and cakes, or stuff that requires parchment paper lining. But of course, a half-size cookie sheet would work just fine, if it’s all that you had on hand! Love butternut squash. Please share the secret to cutting them in half! Haha! It’s not as hard as it seems, Gillian. I’ve described the process in details in this post. Although this one uses spaghetti squash, the process is pretty much the same for butternut squash. To make cutting the squash easier, cut off the stem, poke a few holes in the shell and put the uncut squash in the Microwave oven for 1 – 2 minutes on high (just until it feels warm to the touch), depending on the size of the squash. It will soften the flesh up just enough to make cutting it in half easier and more safe. My hands are small and I have done it this way for more than 10 years. I eat a lot of squash…..A LOT! And this is hands down, the best squash I have had!!! The best way to make it!! You have me sold!!! Plus, the ghee just topped it off so well!!! Thanks for sharing!!! I had this Butternut Squash since Thanksgiving, well it didn’t get made because no one wanted it LOL then Christmas came and went and today I decided I was going to fix it because I am the only one that would eat it anyway!!! 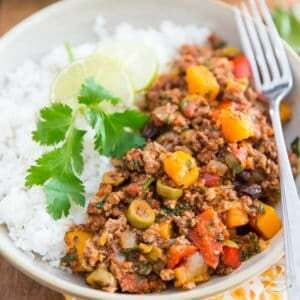 I came to Pinterest to find a recipe and searched, I was not looking for a recipe that had brown sugar or sweetener or a bunch of other ingredients but I in no way thought it was going to be as easy as the one you have posted here!!! I am so happy I found your recipe! I LOVE it!!! EXACTLY what I was looking for and SOOOO easy!!! Love the ice cream scoop tip. I had never made butternut squash until tonight, I found your recipe and it couldn’t have been any easier. Thanks for sharing!! I get veggies from a CSA, and I’m always getting things we’ve never tried before, so I have no idea how to prepare them. This week is was butternut squash. Oh my word, this is sooooo good! Might just be my new favorite food. I hope we get some more in the next box! Thanks for the simple but delish recipe! Glad you liked it, Amanda! If you do get another one, (which I totally hope you do) I’ve plenty more butternut squash recipes on my site (I’m a bit obsessed with them) so feel free to try something new! Oh, and make sure to check out my video to learn how to prep them. They can be a little bit tricky at first, but you’ll soon get the hang of it! 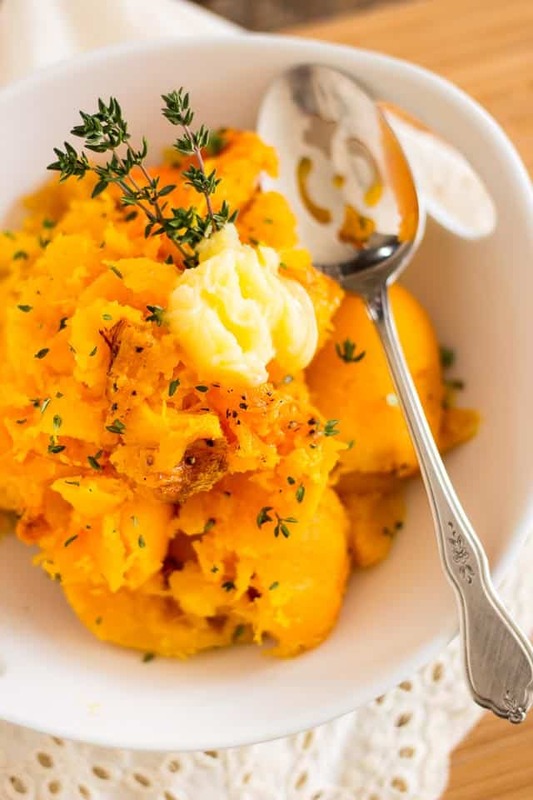 Thank you for this simple way to cook squash! I tried your recipe yesterday for Thanksgiving and it was easy and delicious. I love squash especially the “company “ variation I make with butter, salt and pepper plus a big splash of Kaluha in it Delicious and it elevates an everyday dish to a company one. Once its roasted,add it to some Risotto, at the end of cooking, just when you add the parm. cheese, and it will just melt into the risotto and give it that sweet taste of creamy rice,sweet squash and the salty cheese, doesn’t get any better ! I’m sorry Kathy, I don’t… It’s definitely something to put on my inspiration list, though! I used this recipe for Oven Roasted Butternut Squash for soup, too. This is the recipe I use. Super easy!! I use onion in place of the shallots, usually. I used a whole can of coconut milk and 1 cup broth. Yummy! Thank you Sonia for this recipe! It worked really well for me. I had to add a little time, but had great results! 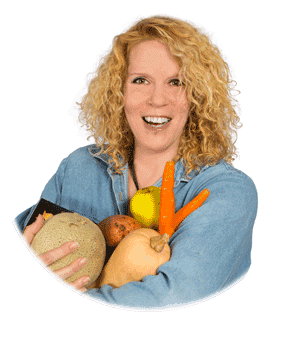 Hi, Sonia i found your recipes mind blowing …i want to try making Caramelized Butternut Squash. 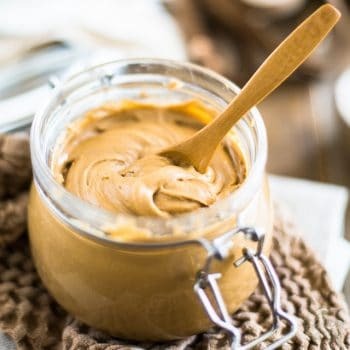 Do you have any simple steps how to make this at home? I don’t have a caramelized butternut squash recipe per se, but I have this candied butternut squash recipe that’s pretty amazing and totally worth making! Thank you very much I will definitely try this and respond you what happen after…Again thank you very much Sonia. 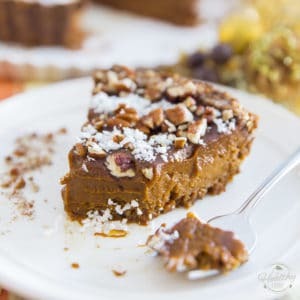 Sonia your tips for making candied butternut squash works mind blowing for me….I serve it in my yesterday home party and everybody love it……..Thank you so so much from the bottom of my heart…….You are amazing. Sonia is there any other recipe which i can try at home especially for my kids………Because I become complete fan of yours and i want to try more recipes of you………. Sorry Melissa, I’ve never tried that, or the frozen version for that matter… so I’m afraid I can’t be of much help here. Sorry. We made this last night and it turned out really well! Will definitely be using this recipe again – thanks! It seemed strange to be baking it flesh side down (that’s not how Mom did it ha ha) but it works! Thank you for posting this! Simple recipes are always helpful. We just recently started eating butternut squash. The one recipe I have calls for peeling and cutting up the squash into cubes. 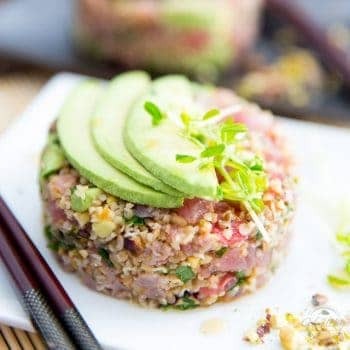 It’s a great recipe but so time consuming we are reluctant to have it often. This can change that! Ha! This method is so much easier and so much tastier, too! I really hope that it convinces you to eat squash more often! This looks great! Going to try it. It’s fresh thyme, Merav. I’d say any kind of fresh herb would work well with this, save maybe for mint or dill… 😉 Parsley, oregano, basil, sage, rosemary, tarragon, chives, savory would all be very suitable contenders, in my opinion. Thanks. You also inspired me to look into savory, which I wasn’t familiar with. Different herbs in this part of the world, but apparently it does exist here (Israel). Always happy to discover new tastes, and glad I discovered your site! Why thank you, Merav. I’m very glad you discovered me too. And happy to have made you discover savory. You should definitely give it a try if you can ever get your hands on it. It has a very interesting flavor, you’ll see! I will be trying your recipe soon. Confused about the seeds and guts, though. Are you roasting them separately on the side or placing the halves on top of them to cook? I love roasted seeds but usually toss the guts. Am I missing something? I just discard them, Gail. Sorry that much wasn’t clear, I updated the recipe card to add that step. Thanks for the quick reply, Sonia! My squash is waiting for Sunday dinner and I’m sure it will be delicious. Making this roasted butternut squash right now and it smells so good. But, then I clicked on the link for your butternut squash soup and I think I might do that instead. Oh, too many choices! Thanks for the recipes! Keep the coming please! OMG, This squash is really looking so delicious!! Actually, I don’t like olive oil. Any substitute? Feel free to use your favorite oil. Made this two days ago and it’s great !! Thank you !!! I just added a little more salt and pepper at the table and it was deelish !!! Just followed your recipe for oven roasted butternut squash…and it is delicious. I want to share how delicious the skins can be. After roasting I scooped out the squash, then I got to wondering about the skins. ‘Found out they are edible, so I fried them in some bacon greased…delicious. As for the nuts, they are soaking for the time being. I’ll be roasting them as well. Also, oven roasted a spaghetti squash following your recipe…can’t wait to try it. This looks delicious! I especially love your soup recipe! Thanks for posting it! Here I am, 71 years old, and I’ve never had a butternut squash before in my life! How deprived! But I had determined to change that before the end of the year and purchased 2 of them the first of October. And there they sat because of my fear of not being able to do it right! I mean, really! How pathetic am I? So just yesterday a friend (well, he called himself a friend) gave us a butternut fresh from his garden. Oh, my! Now I get to mess up a perfectly wonderful squash from a darling friend…what’s a girl to do? 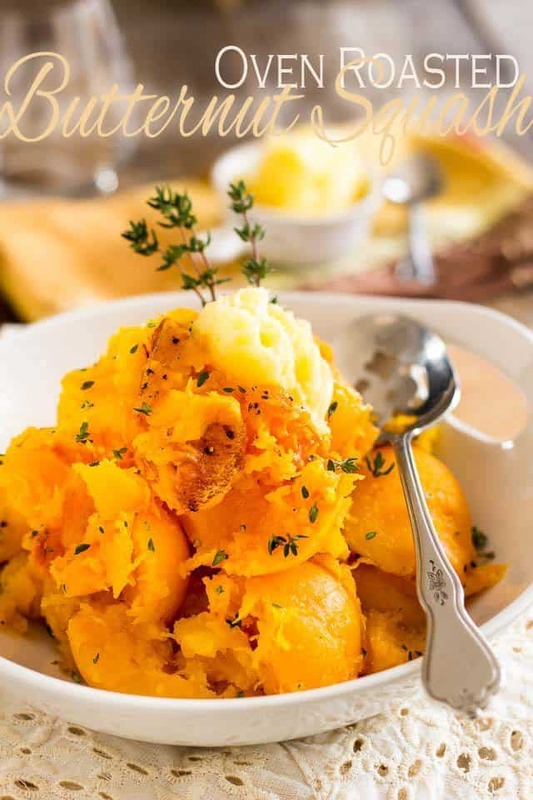 So I tell you… I overcame my fears, pulled up my big girl depends and quickly reached for your recipe on Pinterest for Oven Roasted Butternut Squash! Well, dang, if that didn’t go off perfect! And my husband and I just love love love it! What have I been thinking all these years? It’s not that I had an aversion to butternut…I love many kinds of squash…but this was just not one that my mama ever made. I’m held prisoner to some extent by my upbringing. I wonder how many of us are? Thank you for and Pinterest for helping me widen my horizons. Thank you! It turned out perfectly! And so beautiful. I’m glad I came across your blog! Did you perhaps forget step 5?